This striking, and very unique piece by Kate Spade could be perfect for your wedding day. 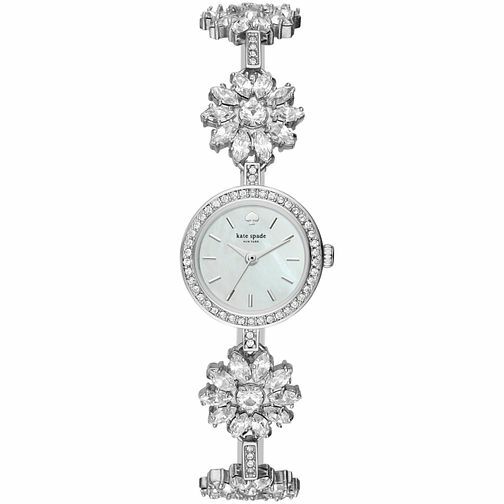 It features a stainless steel and crystal daisy bracelet, a round stainless steel case with a white mother-of-pearl dial with a pavé crystal toping, silver-tone spade at twelve o'clock, silver-tone indices, three hands and Kate spade new York logo. It is powered by Quartz movement and is water resistant to 30 meters. Kate Spade Daisy Ladies' Stainless Steel Bracelet Watch is rated 5.0 out of 5 by 1. Rated 5 out of 5 by Anonymous from So pretty I have been looking for a pretty evening watch for a while and was delighted to find this Kate Spade one. I took it to my local jewellers to have two links removed from the bracelet and was not charged as apparently it was so easy to do. Its sparkly and delicate and has already been much admired.